"Beautifully illustrated and well-written, Taniwha is a delightful storybook." But what do they look like? Poet Mike Johnson and artist Jennifer Rackham come together to explore this great mystery. 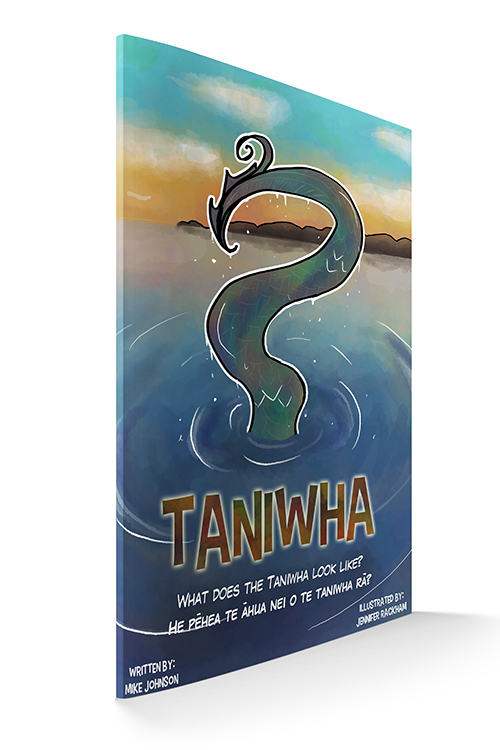 To be read aloud for pleasure, or used as an early reader, Taniwha will delight both young and old. Ko te Taniwha tētahi o ngā tūmomo tupua i rongonui rawa , i tino arohatia hoki e tātou. Engari, he aha kē o rātou hanga? Kua noho tahi a Mike Johnson, he kaitoikupu ia, rāua ko Jenn Rackham, he ringatoi ia, kia whakatewhatewha ai ki tēnei āhua pōkīkī nui. Hei pānui- ā- waha kia ngahau ai, hei pukapuka kaipānui tīmatanga rānei. Ka koa rawa ngā tamariki me ngā pākeke ki Taniwha nei. nobody knows just how far his tail goes!